The BIN-BUTLER® Aeration System is a cost-effective solution for promoting and maintaining material flow. 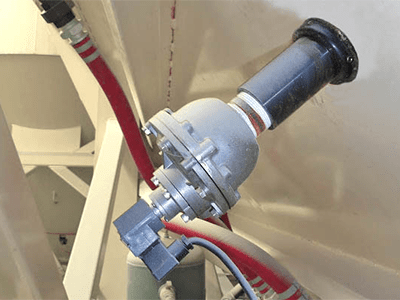 A cost-effective solution for promoting and maintaining the flow of a variety of powders and bulk solids, the BIN-BUTLER® Aeration System injector heads fire a radial pattern of powerful air pulses between the material and the container wall to undercut, excite and put the material in fast motion. The dislodged, stimulated material then gravity-flows downward to the outlet. Our solid-state, Programmable Time-Sequence Controller is used to precisely fire the system’s strategically located injector heads so that they act in concert to maintain a consistent, regulated out-flow during the storage vessel’s discharge cycle. The BIN-BUTLER® Aeration System is quiet, long-lasting, and energy efficient. The average system uses less than 10-CFM of plant air – significantly less than other types of aerators (i.e., air pads, activators, disk/jet type fluidizers), air cannons, lances, or pneumatic vibrators. Because there’s no induced vibration, the BIN-BUTLER® System won’t fatigue storage vessel walls. And, since the System can be mounted from outside the container, the installation is simple and fast so as to minimize labor and downtime costs. 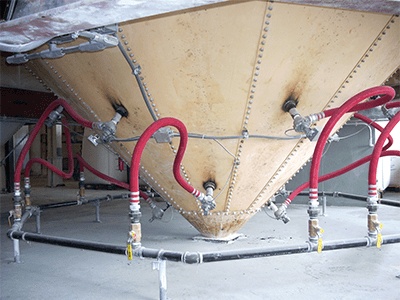 The BIN-BUTLER® Aeration System will instantly induce, and then maintain the flow of a diverse scope of materials encompassing a broad range of bulk density, size, ability to flow, abrasiveness, and other powder and bulk solids characteristics. We’ve solved flow problems from metal, concrete, wood and fiberglass bins, hoppers and silos; through chutes, batchers, conveyor transfer points, ducts, channels, lorry cars, screens, and feeders. 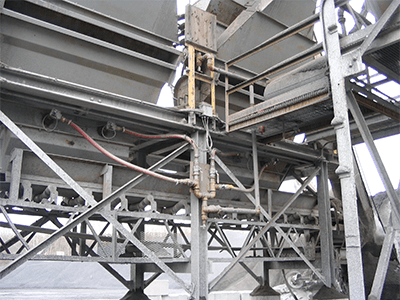 In addition to standard applications, the BIN-BUTLER® System can also be used to aid material flow in enclosed chutes, and pneumatic conveying systems. It acts directly on the stored material (not the structure) to eliminate arching, bridging, clinging, piping, and other flow problems. It restores 100% bin capacity and ensures the First-In / First-Out free flow of even the most stubborn materials. And, when supplied with clean, dry compressed air (or nitrogen) the BIN-BUTLER® System will operate at pressures ranging from 40 – 125 PSI, and in temperatures up to 550°F. To obtain maximum strength and wear resistance, all BIN-BUTLER® injector parts are precision machined from a high-grade, carbon steel (also available in Stainless). Because all components are subject to a rigid quality control system, you’ll get years of continuous, trouble-free operation even under the most severe conditions. In fact, the only moving parts, the piston and spring, exhibit very little wear – even after 1-million cycles. 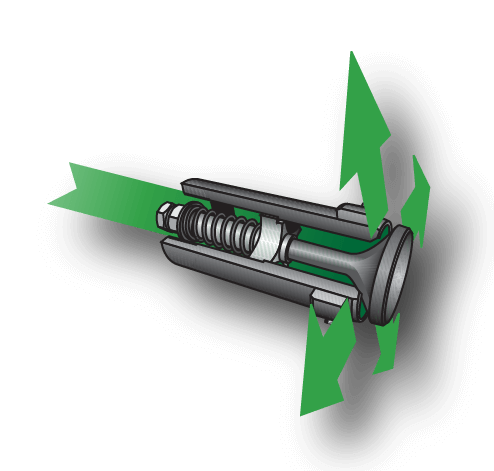 Further, the operating design of the BIN-BUTLER® injector head enables it to rapidly close, and completely resale after each firing – no need for a check valve. The stored material (including dust and fines) is locked out, eliminating the production downtime and maintenance costs associated with the clogging and jamming of air cannons, and other types of aerators. Synergy occurs when a total is greater than the sum of its parts –The BIN-BUTLER® Aeration system is the definition of synergy. 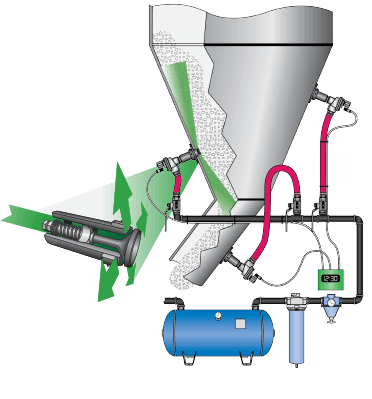 A typical System consists of strategically-located BIN-BUTLER® injector heads; quick-acting, high-flow solenoid valves; level operated, full-flow, self-bleeding, isolation shut-off valves; a solid-state, Programmable Time-Sequence Controller; compressed air filter/dyer; and an air storage receiver tank. When these components are utilized together the outcome is complete and consistent material flow-SYNERGY! The System can operate independently, or can be easily integrated into other equipment, or automation systems to meet your flow requirements. The determination of model, quantity, and area-of-influence of each injector head’s air pulse is dependent on the geometry of the storage vessel, the stored material’s properties and characteristics, the current flow pattern, and the desired outcome. 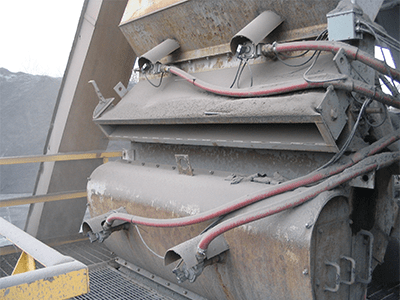 To regain 100% bin capacity, or achieve metered discharge rates, the BIN-BUTLER® injector heads need to be sized and positioned correctly, the application’s air supply needs to be analyzed, and the time-sequence firing pattern determined.